Members of the Oath Keepers walk with their personal weapons on the street during protests in Ferguson, Mo., early Tuesday morning. 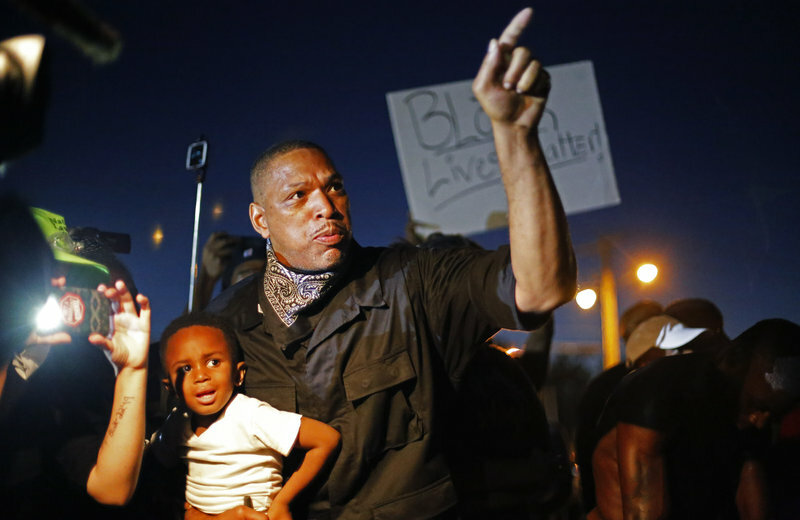 A father holds his son as he takes part in a demonstration in Ferguson, Mo., on Monday night. Police arrested more than 20 people in the city's streets Monday night; no violence or damage was reported. New demonstrations in Ferguson, Mo., led to a standoff with police and the arrests of 23 people Monday night, one day after a vigil for Michael Brown was marred by gunfire. The arrests came as police in riot gear tried to force people to disband and leave the street. The night also brought a new development to Ferguson: sometime after midnight, "a group of five white men who call themselves the Oath Keepers arrived on the scene,"St. Louis Public Radio reports. "They carried assault weapons, which raised alarm from protesters." St. Louis County Police Chief Jon Belmar called the armed presence "both unnecessary and inflammatory," according to NBC News. The Oath Keepers members said they had come to help keep the peace. The group saysits core membership is made up of veterans and active-duty members of the military and first responders, such as police and firefighters. Monday night did not bring new reports of violence or property damage, according to the St. Louis County Police. St. Louis Public Radio says that in addition to the arrests, police used pepper spray to try to break up the crowd of demonstrators on West Florissant Avenue. Police said "protesters would periodically throw bottles, frozen water bottles and rocks at police officers on-scene." No injuries were reported by police or civilians. The new round of demonstrations center on Sunday&apos;s anniversary of the killing of Brown, an 18-year-old black Ferguson resident who was unarmed when he was shot by (now former) police officer Darren Wilson, who is white. On Sunday, an outburst of gunfire disrupted protests and left an 18-year-old African-American man critically wounded by police. St. Louis County Executive Steve Stenger issued a state of emergency Monday, a move that gives St. Louis County authority over police emergency management in Ferguson and surrounding areas. Also Monday afternoon, activist and philosophy professor Cornel West was among protesters arrested at a sit-in at the St. Louis County Federal Courthouse. U.S. Attorney General Richard Callahan said that nearly 60 protesters were arrested Monday "for obstructing the normal use of the entrances" to the federal courthouse in St. Louis.